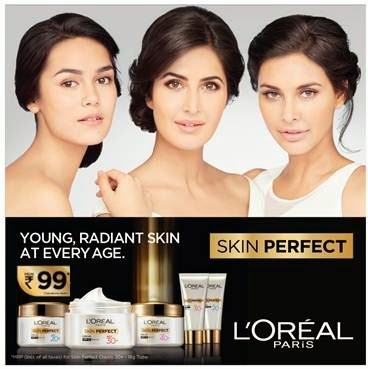 Loreal Paris Skin Perfect Range has comes as a solution to the skin problems of every age - 20+, 30+, 40+. You don't need to worry now whether you are in your twenties, thirties or even forties since this perfect skin care range for every age will take care of all your skin issues giving you a flawless glowing skin that's complimented by all. Before we go further, lets take a look at what L'Oreal has to say about this skin perfect range and about its launch. Age 30+ Skin Perfect Range comprises of a moisturizing cream along with cleansing foam. Both contain Pro Collagen which is perfect for fighting those fine lines that begin to appear in your thirties, giving you younger, glowing skin. The 18g Cream is priced at Rs 149, 50 g Cream is priced at Rs 425 and the Cleanser is priced at Rs 135. Age 40+ Skin Perfect cream helps work on all those skin problems aging causes. Packed with Pro Retinol A it helps get rid of wrinkles and revitalizes your skin. It helps you get that flawless looking skin even post 40. After all age is just a number! The 50 g Cream is priced at Rs 595. About L'Oréal Paris: A truly global beauty brand combines the latest in technology with the highest in quality for the ultimate in luxury beauty at mass. Our signature phrase, “Because I’m Worth It”, is meant to inspire each and every woman to embrace her own unique beauty and reinforce her sense of self-worth. As the biggest beauty brand in the world, L'Oréal has an unparalleled commitment to technology, research and innovation, providing groundbreaking, high- quality products for women and men of all ages and ethnicities. This brand encompasses the four major beauty categories – hair color, cosmetics, hair care, and skin care – and includes such well-known brands as Excellence Crème, Total Repair 5 hair care, Youth Code, Fall Repair, Revitalift, Volume Million Lashes Mascara, Colour Riche lipsticks, Superliners and True Match foundations among many others. L'Oréal Paris truly believes that, whatever your age, gender, ethnicity or look, "you're worth it"